What’s changed is the battery and the front camera. The front camera now matches the rear camera, meaning you can make video calls in 720p. That’s definitely a step up from the prior generation’s VGA camera, but still nothing to get too excited about. While Amazon hasn’t offered any specs for the battery capacity, it claims that the Fire HD 8 now gets “up to 10 hours of reading, listening to music, watching TV shows or movies, browsing the web, and more.” That’s about the same as the iPad and other similar tablets, but two hours less than last year’s Fire HD 8 tablet. The reason is because of the Fire HD 8’s other new feature: always-on hands-free Alexa. Where the previous Fire 8 tablet needed to either be plugged in or unlocked to summon Alexa, the new model will always be listening for its wake word, so you can play music, ask questions, and control your smart devices at all times. It also includes the new Show Mode, which turns the tablet into a makeshift Echo device. Two hours of battery life is a pretty big tradeoff for something that millions of devices can already do, but 10 hours should still be enough for screen-happy kids to get through the day. 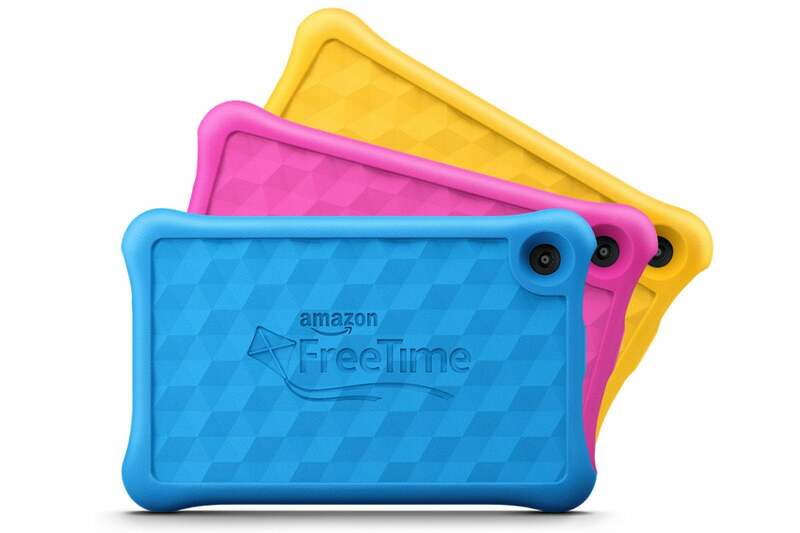 Speaking of kids, Amazon also updated its Fire HD 8 Kids Edition, which brings a year of Amazon FreeTime Unlimited (normally $3/month for Prime members; $5/month for non-Prime members), a silicone case, and a 2-year worry-free guarantee. Additionally, a catalogue of kid-friendly Audible books is coming to FreeTime Unlimited soon, along with a new interface design that makes it easier for kids to find what they want to watch, play, and read. The service will also be now available in Spanish, the first non-English language Amazon has offered. The Amazon Fire HD 8 Kids Edition comes with a silicone case and a year of Amazon FreeTime Unlimited. 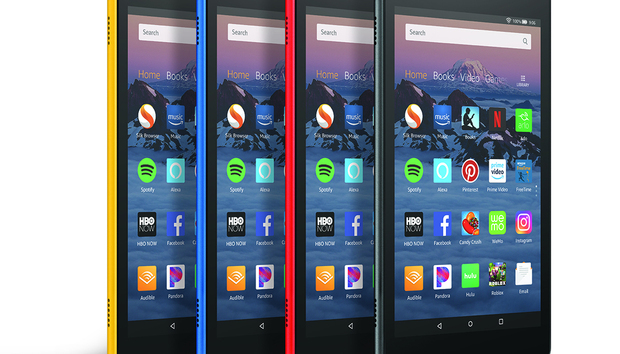 The Fire HD 8 tablet is available in the same four colors (black, blue, red, and yellow) starting at the same $80 price tag with “special offers” (read: ads) or $95 without. The Fire HD 8 Kids EditionRemove non-product link comes in blue, pink, and yellow and will cost $130 for 32GB of storage or a two-pack for $195. Both tablets will begin shipping October 4. Why this matters: Amazon’s Fire HD tablets are among the most popular budget Android tablets around, and the 8-inch model hits the sweet spot for price and features. It would have been nice for Amazon to upgrade something that matters, like the base storage or the screen quality, but it’s still a great value, even with two hours less of battery life.